White balance that is. The difference is obvious in this photo of a layout I posted yesterday and the only reason I am re-posting it is because it is for the Merly challenge and I didn't want to upload yesterday's version. Now you can see it was actually done on Kraft card. My niece and younger son get on really well despite the 8 year difference in their ages. They had both been eating blue sweets and were pulling blue tongues at each other-a good time for a photo. they are daft. 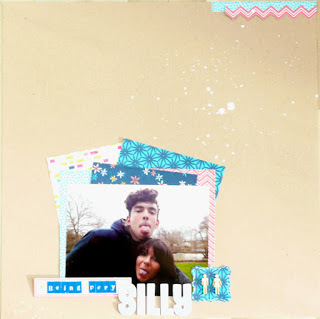 Thank you for entering the Merly challenge, just love that fun photo and great colours on your layout. didn't we have a lovely day ?